We had a fantastic first day of sight seeing in New Delhi. For those of you who are biting your nails with worry that we are over here on our own navigating the wild streets of India, don't worry. Wes planned our whole holiday with Intrepid Travel and we had a private tour guide and driver all day. Which meant a personalized interpreter and more important, air conditioned travel!! It was over 100 degrees today, which meant that both of us sweated out all the calories we packed in when we were in the Maldives. Our tour guide Shyaam came and picked us up here at the hotel first thing this morning for a tour of temples around. On our way to our first stop he gave us a fascinating overview of the Hindi religion and a few of its primary gods. The first temple was Hanuman Mandir where 24 hour long chanting has been taking place since 1964. We were welcomed warmly and given sweets by the temple priests. They also gave each of us a traditional tilak. It is related to a bindi in that it is a paste dot applied to the forehead, but it is intended for men and women and is more spiritual then decoration. Then on to the Birla Mandir and Lotus Temple. 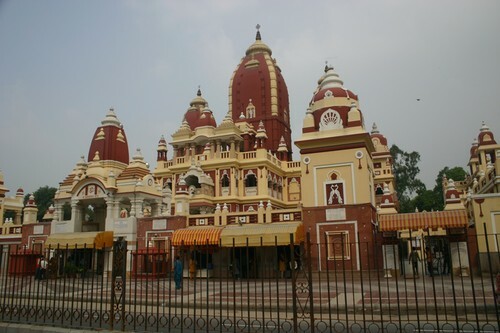 The Birla Mandir was built in 1938 and dedicated to the Hindu god, Vishnu. The Lotus temple was breathtaking, all made of marble. The religion of Baha'i was the most interesting to me, very science and humanitarian based. Finally we were on our way to the newest of the temples we saw today, Akshardham Temple. It was awe inspiring, we weren't allowed to take any pictures but Wes got a few from the car before we parked. Inside we saw acres of intricately designed gates, gods, and elephants. They also had a lotus garden with a walking path elevated above the garden. We had lunch here, I ate god knows what. Shyaam bought us lunch so I didn't want to be rude and not eat the food so I manned up. I drew the line at the yogurt milk, though!